Moweaqua (population 1,923) is located in south-central Illinois about 12 miles south of Decatur. A vast majority of Moweaqua sits in the northwestern portion of Shelby County. A very small portion bleeds over into the northeast corner of Christian County. U.S. Route 51 is the main roadway to and from Moweaqua. The Long Grove Creek flows by the north side of town. A line of the Illinois Gulf Central Railroad runs through town as well. The history of the town of Moweaqua was not found by the writer of this page. It is known there was a mining disaster in Moweaqua in the early 1930s. It is probable that Moweaqua was established in the early to mid 1800s. A school system was probably established near the same time. 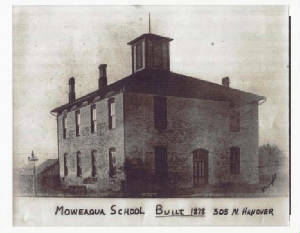 A high school curriculum for the students of Moweaqua was probably in place by the late 1800s or at the latest the early 1900s. We know that Moweaqua High School served the town on a solo basis for many decades. It was in the early 1990s that Moweaqua High School began consolidation talks with its neighbor to the southwest, Assumption. This effort was finalized in 1992 with the creation of the Central A & M School District. 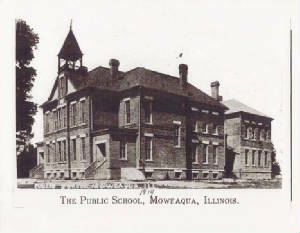 The high school for the Central A & M School District was placed in the Moweaqua High School building where it remains today. Moweaqua HS team nickname: the "Indians"
School Fight Song: "Moweaqua Loyalty"
And tell to all the world around, "Moweaqua High is best!" Those cheers we gave together; yes we hear them ringing yet. Cheer for Moweaqua High! Rah! Rah! We are ready let's go for the Blue & Gold. Dear Moweaqua High! Rah! Rah! The Moweaqua High School boys competed in basketball, football, track, and possibly baseball. The girls competed in basketball, bowling, volleyball, and track, possibly even softball (www.ihsa.org). There were many reasons to cheer in Moweaqua when school was in session and sports were being played. We are in need of the Moweaqua HS team nickname, team colors, school fight song, and many of the team records and coach's names. It is apparent that the "friday night lights" were what the folks of Moweaqua lived for. Every season from 1950 through the 1992 closure of the school is recorded on the IHSA website. Moweaqua HS ended its solo high school life with SEVEN consecutive trips to the IHSA Class 1A Playoffs in football. Better records and coach's names are listed below. Side Note: As Moweaqua Central A & M the school won a State Championship in football in Class 2A in 1997 under the guidance of Coach Mark Ramsey!! The Moweaqua lady bowlers enjoyed two seasons in which they competed in the State Bowling Tournament winning the District title and advancing to the State competition. The Moweaqua boys basketball program won a pair of Regionals, the last coming in their last year of existence. Several scores involving Moweaqua HS were located on a website titled "Illinois Postseason Basketball Scores." These scores are listed below when available. Atwood lost to Centralia in State Title game! 1874-75 Postseason scores, record, and coach's name needed. The Moweaqua HS boys track team won a Sectional title, earned eleven individual medals, and had two boys crowned STATE CHAMPIONS in their respective events! 1981-82A Curt Stiner 800 Meter Run STATE CHAMPION!! Scot Adamson 300 Meter Hurdles STATE CHAMPION!! The lady netters never won a State Tourney trophy, however they had some GREAT seasons their last three years as Moweaqua High. Three straight 20-plus game winning seasons under the leadership of Coach Tina McElroy, including a 28 - 2 record in 1989-90, let the Moweaqua volleyball program go out with great pride. The Moweaqua ladies competed in basketball as well. We only have the coach's name from two of those seasons. We are looking for coach's names and good team records to add to this list.